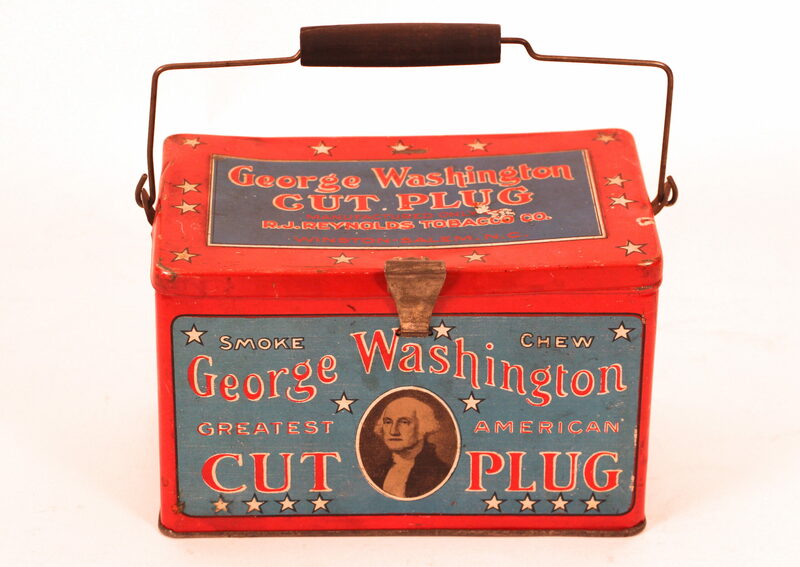 The George Washington Cut Plug tobacco lunch box tin was used by children to take their lunches to school in the late 1800’s to early 1900’s. They marched off to school hauling their tobacco lunch pails made out of a colorful tin that had convenient wire handles on the top for carrying. This George Washington tobacco brand tin represents a very colorful box with great eye appeal, featuring an image of the first President of the United States on their logo. 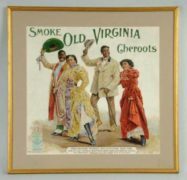 The George Washington brand was one of the more popular tobacco brands in the early 1900’s. 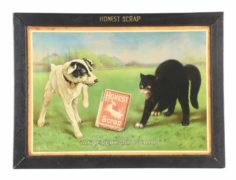 Overall, smoking tobacco lunch box tins are highly sought after and offer a unique history. 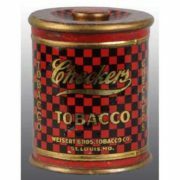 Many men carried their lunches to work in these metal tobacco tins. It was actually considered a clue that the family didn’t have enough money to purchase a hot meal. In spite of that, school-aged children wanted to mimic their fathers and used the same lunch caddies made from their pop’s old tobacco tins. Interestingly, the neighborhood general stores didn’t really care for the lunch box style tobacco tins because they were difficult to stack on shelves due to the wire handles. The tobacco lunch box tins were adorned with a company’s logo and artwork that stated slogans such as ”Sensation Smoking Tobacco” and “ Cut Plug Smoking or Chew” and “Sweet Mist Taste Great”.